Luxury and Boutique Hotels – Is it worth parking your car at the airport? Is it worth parking your car at the airport? Over the past 10 years we have managed an average of 5 international trips a year. When organising each trip the same thought comes up…is it worth driving and parking the car at the airport OR getting public transport/ taxi there instead? Often cheaper than getting public transport or a return taxi trip. So much easier when travelling with large or multiple suitcases or even a young baby/ child. No dragging everything onto a bus or trying to fit things into a small taxi. Plus it’s only a short walk to the airport. Knowing your car is right outside the terminal so you don’t have to wait for a pickup. Your car is likely to be more secure at an airport car park than parked outside your house! Forgetting where you parked your car after your relaxing holiday! It’s stressful knowing someone else is in control over whether you arrive on time or late. If using public transport, it can involve several changes of trains or buses which isn’t easy with suitcases or a baby. Having a set departure time doesn’t allow any flexibility for last minute issues which might arise on your travel prep. Public transport times may not suit your flight departure time, so you spend (often expensive) hours hanging around the airport rather than risk cutting it too fine. The frustration of numerous stops when you just want the bus/ train to get you home! Having to wait for your taxi/ bus/ train to pick you up at the airport when all you want to do is be at home. 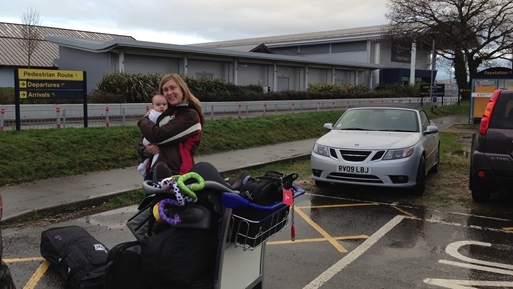 Overall, the volume of luggage we took plus travelling with our 6 month year old was reason enough to park at Bournemouth Airport (and as you can see above we got a great spot!) As for any future trips, I think we will always look for airport parking as it is the easiest and most convenient option. For this trip from Bournemouth Airport, we booked our airport parking with SkyParkSecure as we found them to be the cheapest available online.